Ellen Goodman, co-founder of the Conversation Project is raising awareness about the importance of having conversations about end of life care and wishes. In the last 15 years, the field of palliative care has experienced stunning growth. Over 1,700 hospitals with more than 50 beds have a palliative care team today. And, palliative care is spreading beyond the hospital into community settings where people with serious illnesses actually live. Any information or experiences you’d like add, please share it below. Thank you. That was the sentiment of a 76-year-old patient who showed up in the emergency room at University Hospital this week, her fourth trip to the east Salt Lake City hospital this year. "She couldn’t be more clear," said Holli Martinez, director of the hospital’s palliative-care team, who met with the patient. "She said, ‘I want to get out of here. I want to be home.’ "
So Martinez, who is receiving a $50,000 palliative-care award in Portland, Ore., on Thursday, helped the patient and her family figure out how she could go home and still receive care via hospice. "If we had not had that conversation, she’d be back in the hospital — tests, meds, labs," said Martinez, one of five recipients of the Cambia Health Foundation’s Sojourns Award this year. The foundation is a nonprofit connected to Cambia Health Solutions, which has BlueCross and BlueShield insurance plans as well as other business interests in Oregon, Washington, Idaho and Utah. All five recipients are from those states. Martinez, the fourth straight winner from Utah, will use the money to improve palliative care at the hospital. Palliative care, she said, is all about helping patients who face life-threatening or serious illnesses understand the benefits and burdens of aggressive treatment — and the option to opt out. "Oftentimes, if we don’t stop and have the conversation," Martinez said, "we’re giving them an extraordinary amount of life-prolonging care that they might not want." Palliative care, which sprouted from the hospice movement, is a growing medical specialty in Utah and across the nation. Utah earned a C from the Center to Advance Palliative Care in its 2011 report card, while most states got B’s . The data in that report were from 2009 and indicated that nine of Utah’s 15 hospitals with at least 50 beds had palliative-care teams. By 2011, the number rose to 11, or 73 percent of the 15 hospitals with 50 or more beds, CAPC research director Rachel Augustin said Wednesday. Nationally, less than a quarter of hospitals with 50 or more beds had palliative-care teams in 2000. By 2011, the proportion grew to 66 percent. By next year, it’s expected to be 84 percent. Patricia Berry, associate director of the University of Utah Hartford Center for Geriatric Nursing, won the $50,000 award last year and nominated Martinez this year. "Holli is the best there is," Berry said. "I would want her at my bedside." The directory Martinez developed helps patients pick hospices based on their needs, Berry explained, "rather than handing them a phone book, which often happens." Martinez is also finishing a project to guide intensive-care doctors and nurses about when to call in the palliative-care team. "Holli has done a great deal to really advance palliative care in the state," said Berry, whose own $50,000 award is being used for the College of Nursing’s Caring Connections grief-support program and to help teach an end-of-life class to undergrads. Angela Hult, executive director of the Cambia Health Foundation, said the foundation’s founders chose to focus on palliative care because it touches everyone. "At the same time, this work really has the capacity to be transformative," she said. "It’s about asking the question: ‘What matters to you rather than what’s the matter with you?’ "
Martinez was a hospice nurse before she went to graduate school and became a nurse practitioner. She is one of four Utah nurse practitioners who are board-certified in palliative care and hospice. She joined University Hospital’s palliative-care team in 2007 and has been director since 2010. One of the first projects she undertook when she arrived, Berry said, was to survey the region’s hospices to ascertain those with the best evidence-based practices. 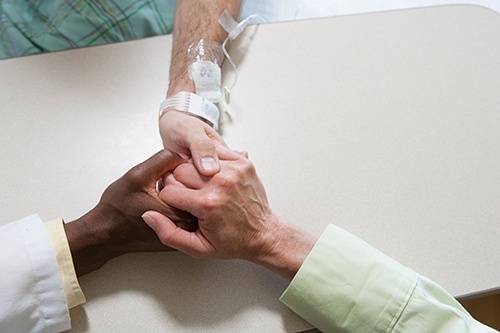 While palliative care is more upstream than hospice — caring for patients who are not necessarily dying — patients who decide against aggressive treatment often are referred to hospice for end-of-life care.